A leader of a right-wing group, instrumental in shocking recreation of the shooting of Mahatma Gandhi and missing since, was arrested yesterday. 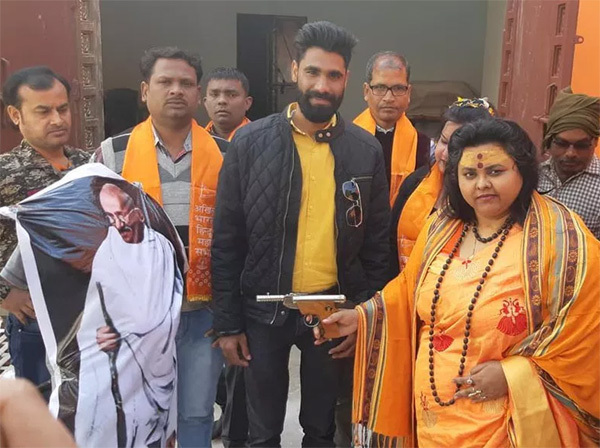 Pooja Shakun Pandey, a leader of the Hindu Mahasabha -- to which Mahatma Gandhi's killer, Nathuram Godse also belonged -- was caught from Aligarh in Uttar Pradesh. Her husband Ashok Pandey was also taken into custody, the police said. On January 30, the death anniversary of Mahatma Gandhi, the Hindu Mahasabha held a function at Aligarh during which Godse's statue was garlanded and sweets were distributed.The enactment of the assassination was also held and reporters were told that it would henceforth be held every year like the burning of the demon king Ravana's effigy during Dusshera. Who is Pooja Shakun Pandey ? Pooja Shakun Pandey is the National Secretary of Akhil Bhartiya Hindu Mahasabha, now defunct entity of Veer Savarkar. She is considered a firebrand young Hindu leader who has gotten immense popularity in rural hinterland. The popularity emanates from reckless behaviour that she publicly shows.Pooja was recently seen firing at an effigy of Mahatma Gandhi. Liquid was used to show blood flowing through the body of Gandhi Ji. Now, in a democracy, you have every right to dissent from any voices. You have right to criticize Mahatma Gandhi. But, this public show of violence in the name of protest should always be detested with full force. Pooja Shakun Pandey is also an ardent critic of Narendra Modi. However, at more than one occasions, she was seen with Uma Bharti, the most useless Cabinet Minister of the Union Government led by Modi. Awards and Recognition: Pooja was appointed the first judge of Hindu Court. This court is established by Hindu Mahasabha on the lines of Shariat Court of Mulsims. In India, both Shariat and Hindu courts have no relevance. Relationship Status: She is a Sadhvi. However, she is not unmarried. She developed physical attraction towards Ashok Pandey and had broken the vow to remain single throughout life. She is currently married with Ashok Pandey, a Hindu activist like Pooja Shakun.